Did you know that Yuri Gagarin, the first man in space, was awarded a medal “For the Development of Virgin Lands”? Or that Stalin’s favorite decoration was “Hero of Socialist Labor”? In the Soviet era, many people received medals for "labor valor" and other deeds that are not normally perceived as deserving of medals. “The Soviet state positioned itself as a workers’ state,” says Igor, a collector. But in the early years of this state, the only decorations that existed were war medals and honors. So, “there must have been a realization that the existence of solely war medals wasn't in line with the state ideology." Orders and medals are a part of military life, but why would the state give decorations for valor during peaceful time? The Communist ideology placed an emphasis on heroism, finding it in many areas that today are not considered especially “heroic”. In the Soviet Union, which in its early period was often referred to as "the dictatorship of the proletariat," the cult of labor was actively promoted, and medals were supposed to play an important role in that process. In the Soviet realm, every citizen was fighting his battle in the greater struggle for world peace, led by the state. So if a man was exceptionally good at his work as a miner, writer or musical director, the state would recognise his achievements with an award. If a woman was so strong and caring that she managed to raise multiple children, then she too contributed to the state’s success, and the state would reward her for that. The first decorations for peacetime valor in Russia were introduced by the Tsarist government, and the USSR inherited this idea. "Any state has labor medals, but the fewer the financial incentives, the more medals there are," Roman Slivin, another collector, said. The Medal “For Labor Valor”, introduced in 1938, was intended to be awarded "to especially deserving workers, recognizing and honoring dedicated and valorous labor or substantial contributions to science, culture and manufacturing." Along with that medal, the status of Hero of Socialist Labor and a corresponding medal were introduced. "The first recipient of the medal was Joseph Stalin, and he was very proud of it and always wore the medal, unlike his other awards," Igor said. 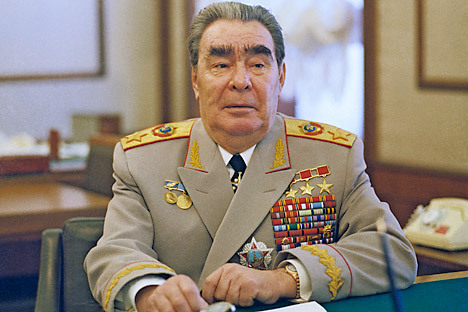 Another Soviet leader, Leonid Brezhnev, on the contrary, had four different jackets with different sets of medals and orders. From a medal “For The Restoration of the Black Metallurgy Enterprises of the South” to four “Hero of the Soviet Union” medals, Brezhnev had 16 orders and 22 medals of the Soviet Union and over 50 decorations from foreign states – and also a membership card from the Soviet Union of Journalists. As WWII receded into the past, there was a shift away from rewarding people's heroic deeds and toward decorating people merely for long periods of uninterrupted service. This idea also came from Tsarist Russia, where decorations for “irreproachable service” were awarded to those who had incurred no penalties or reprimands during their working life. In the USSR, several decrees of that kind were adopted. Under one, locomotive drivers were supposed to receive the Medal “For Distinguished Labor” after 10 years of uninterrupted service, the Medal “For Labor Valor” after 15 years, the Order of the Badge of Honor after 20 years and the Order of the Red Banner of Labor after 25 years. The Medal “For Courage in a Fire” was introduced to "to recognize deeds of courage and of leadership while fighting fires." The Medal “For the Salvation of the Drowning” was also introduced, and its name sounded quite ironic for Soviet people, who remembered a mock slogan from the classic “The Golden Calf” by Soviet humourist writers Ilf and Petrov – “the rescue of a drowning man is the task of the drowning man himself”. According to Roman Slivin, the idea behind such medals was to distinguish regular people who showed bravery in emergencies, rather than professionals whose job it was. Meanwhile, not many people in Russia today would make sense of the 1956 Medal “For the Development of Virgin Lands”. The Virgin Lands Campaign was a pet project by then Soviet leader Nikita Khrushchev dedicated to increasing agricultural production in the USSR, and the medal was awarded to those involved in the initiative in Kazakhstan, Siberia, the Urals, the Volga region and the North Caucasus. Incidentally, in 1961, that medal was awarded to Russia's first cosmonaut Yuri Gagarin, who landed after his space flight on what was considered "virgin land" in the Volga region. In the Soviet hierarchy of values, maternity was also considered a heroic activity. In 1944, the Order of Maternal Glory was established, with 1st, 2nd and 3rd classes, and was awarded to women who gave birth to and brought up nine, eight and seven children, respectively. Conditions for raising children from the 1940s to the mid-1970s were extremely hard, so bestowing the status of "heroines" on mothers of large families essentially served as recognition of this reality. There was also a more practical consideration for establishing the award, as the Soviet government wanted to boost the birth rate following WWII. Soviet medals and orders ceased to be awarded after the collapse of the Soviet Union in late 1991. However, over the next years, several Soviet-era awards have been reintroduced in Russia. In 1994, the Medal “For Life Saving” was introduced – a replacement for the medals “For Courage in a Fire” and “For the Salvation of the Drowning”. In 2010, as the government tried to boost the birth rate, the Order of Paternal Glory, which serves "to reward deserving parents of exceptionally large families", appeared.